I picked up Beginning Ubuntu Linux, Second Edition with a sense of familiarity; I also had the pleasure of reviewing the First Edition and found the experience to be a gentle and very complete introduction to Ubuntu. It’s as though Keir Thomas wants to ensure that anyone starting out with GNU/Linux won’t feel like a worthless newb being thrown to the proverbial geeks, who will guffaw and point and weeze asthmatically and incomprehensibly. So, because I already know that I appreciate Keir Thomas’s abilities, I thought I should review the Second Edition with a slightly different goal. Would my mother, who is quite computer literate in the Windows department and is about to migrate to Ubuntu (yay! ), be able to use this book sucessfully? And will her experience of Beginning Ubuntu Linux be a breeze? My response to my posed question, after careful consideration, is yes. Keir Thomas walks you through the whole experience from beginning to end, comforting you with a calm voice when you might be feeling a bit lost. He doesn’t just plunge the reader blindly into complex computer jargon; instead, he starts off with a little GNU/Linux introduction to give you a boost before you start. He runs through all your options about the actual physicalities of the changeover, whether you want to dual boot or just go the whole hog. He preempts the sort of questions you might have. He gets you up and running, secure, and includes a great section about Ubuntu replacements for Windows programs and explains in detail how to use them. All in all, I think mum’s going to be impressed. Beginning Ubuntu Linux is a whopping great 684 pages; it’s no lightweight and if you do a lot of walking, you mightn’t want it along for company unless you’re Mary Poppins. But this really just means Keir Thomas has done a great and thourough job. I wouldn’t call any of the material in this book extraneous for this audience; when you are braving a whole new world in computing, more is more. I would even call the size of the book comforting for users. Similar to the first edition, Beginning Ubuntu Linux is divided into seven parts (not including the appendixes), starting off with GNU/Linux in general and then getting into specifics. Part one introduces GNU/Linux in general, why it’s great, the politics, and why you would want to run it. Part two eases you through the first and scariest bit... pre-installation, installation, and any issues. Don’t worry, you’re in good hands! Part three is the realities of getting started. Booting, getting everything going, security, personalising Ubuntu, and file management. Part four introduces the BASH shell. Part five assists you with multimedia devices. Part six is devoted to the OpenOffice.org suite and how to use it, and part seven keeps you running on the day to day stuff, backing up and whatnot. There are a couple changes in the book’s second edition. Firstly, it has been updated to take into account the release of Edgy Eft (6.10). There is also added content for extra edification; things like information on antiviral software, and repositories, which are a new feature with Edgy. My Mum! And anyone else who is ready to make the change, but wants to be independent about it, cautious about it, and have an almighty great reference book as their best friend. Seriously. 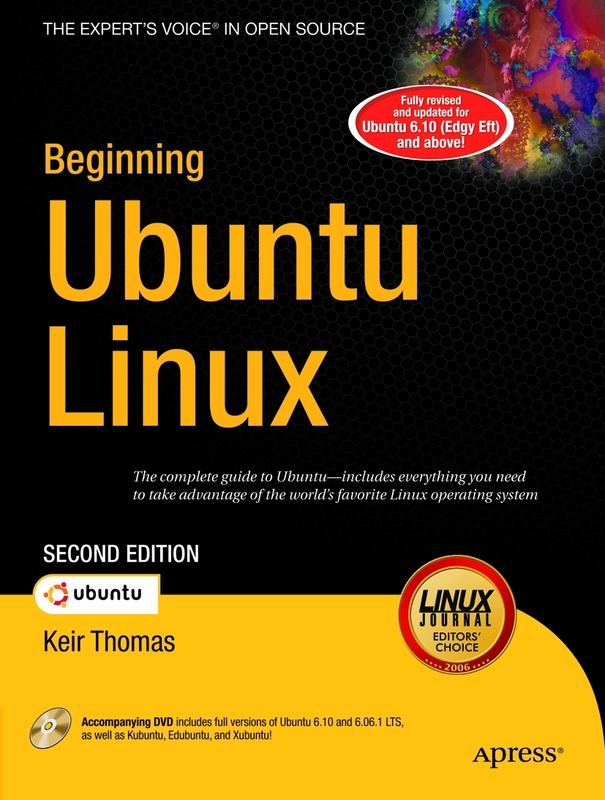 Ubuntu in its new release is just looking so user friendly and good right now that it’s time to get it on the desktop, ladies and gentlemen, and recommending this book to newbs is how we can do it. Completely relevant. Obviously, the whole idea of this book is that you are going to use free software. It really is a must have for would-be Ubuntu converts with nerves. They’ll have a read and wonder what they were concerned about!